covered by melamine formal­dehyde. It is highly resistant to heat, scratching, wear and stains and very suit­able for kitchen worktops. These days, the majority of kitchen worktops come as plastic laminate already bonded to a chipboard core. But you might need to cut and fix laminate if you are covering an existing surface or if you are adding an edging strip to an exposed worktop. Laminate can be cut with a hand or power saw or by scoring the decorative surface with a trimming knife (with a special blade). If using any kind of saw, always work with the decorative side upwards and support it well. Cut slightly oversize to allow for trimming later. 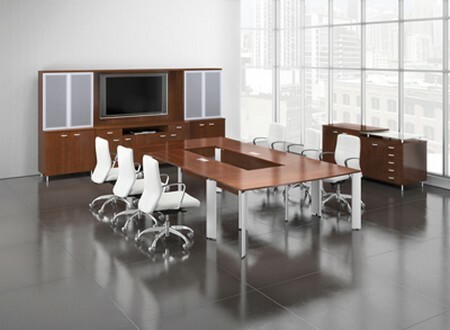 Contact adhesives are used for securing laminates. Unless you are using the type which allows for some adjustment after the adhesive has dried, you will need to take care to gel the position right first time. For a large horizontal sheet, place drawing-pins at the back of the area so that the sheet can be leant against these and slowly lowered into position. 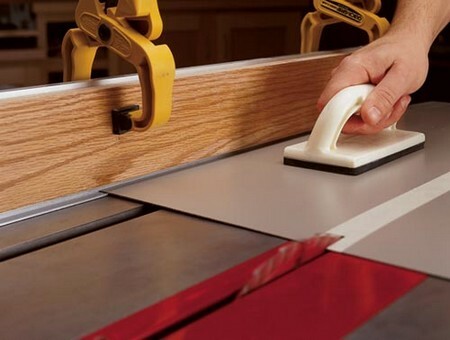 For edge strips, allow extra on both sides which can be trimmed off afterwards. Make sure the laminate is firmly held in place until the contact adhesive has set. Once the adhesive is dry – allow at least half an hour – you can trim off the excess laminate. If there is a lot (on a supplied edging strip, for example), this needs care to avoid splitting the laminate. Tools you can use for trimming include files, planes and trimming tools (Surforms). Two par­ticularly useful tools are a powered file (use with care) and a replaceable-blade plane fitted with a special laminate cut­ting blade. Always work from the ends towards the centre and take particular care over postformcd edges – laminate is quite brittle. A glue gun works by melting sticks of special glue which sets as it cools. The heat comes from electricity (which lies you to an electric socket outlet or an extension lead), but the type of glue and the speed with which you can work makes a glue gun ideal for modelling, for stick­ing paper and (surprisingly) for gluing low-voltage wire (such as bell wire, telephone wire or burglar alarm wire) in place unobtrusively. A glue gun looks a little like a small electric drill and is operated in one of two ways. With thumb-operated models you feed the stick of glue into the back of the gun – the rate of feed depends on thumb pressure. With trigger-operated guns much longer sticks are used and higher feed rates are possible. Glue guns can make good joints in wood, rigid plastic and PVC, but would not be any use where the item to be re­paired was subjected to wet heat.